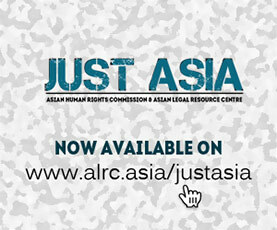 The Asian Human Rights Commission (AHRC) has received information that a leading rights activist and partner of the AHRC has been accused of criminal defamation by the former deputy chief of Indonesias State Intelligence Agency, after he testified against the latter for his involvement in the murder of Munir Said Thalib. 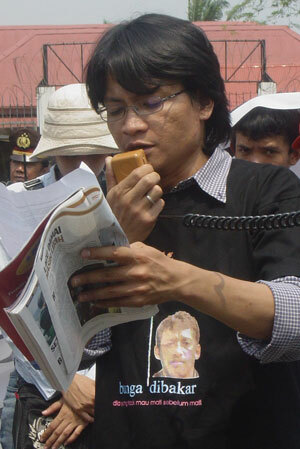 Munir is considered the countrys most prominent and respected human rights defender and was poisoned in 2004. The incident once again emphasises the unresolved status of the case and reveals the persecution facing the few still trying to get justice five years on. The AHRC is alarmed by the increasing frequency with which the laws of the country are being manipulatively deployed to obstruct the work of human rights defenders. Mr. Usman Hamid is the Executive Director of the Commission for the Disappeared and Victims of Violence (KontraS). It was founded by civil society activist Munir Said Thalib who was notoriously poisoned on a plane in 2004 after vocal criticism of the Indonesian government and military (see: AHRC-STM-186; UP-129-2007; UA-164-2004). After Munirs death Mr. Hamid became head of KontraS and with his colleagues has relentlessly pushed for investigations into the murder. On September 3 Mr. Hamid received a summons letter from the police referring to a complaint filed on 9 January 2009 by the lawyer of Mr. Muchdi Purwopranjono (known as Muchdi PR), former deputy chief of State Intelligence Agency (BIN). The summons accused Mr. Hamid of criminal defamation. Mr. Hamid was a witness in Mr. Muchdi PRs trial (which began in August 2008 at the South Jakarta District Court) for his alleged instigation of the assassination. Mr. Muchdi PR filed a complaint against Mr. Hamid and several other activists immediately after his aquittal on 31 December. It accused them of yelling ‘murderer, murderer’ in the court after the judge announced the verdict, and the Indonesian National Police have recommended Mr. Hamid as a suspect, using Articles 310 and 314 of the Penal Code. On 9 September Mr. Hamid reported to the Jakarta Regional Police. He asked for clarification of the accusation and asked to give his statement for the police investigation report (BAP) at a later time, since he had an appointment with the Secretary General of the National Defense Council on the same day. His request was granted and the investigation is currently pending. 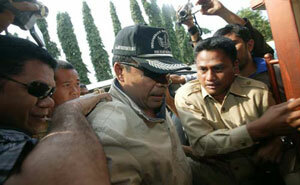 After Mr. Muchdi PRs acquittal Munir’s legal representatives and supporters appealed to the Supreme Court. A second trial took place earlier this year with Mr. Hamid again testifying as a witness, but what followed was widely considered a flawed trial that neglecte vital evidence. Mr. Muchdi PR was acquitted. It was a disheartening setback for civil society activists and reveals the extent of the judicial protection enjoyed by those in senior military position in the country. The ensuing accusations against Mr. Hamid have challenged his reputation as a human rights activist and are hampering his work on the case. This is not an isolated incident in Indonesia. In two other recent cases reported by the AHRC, eight activists in Aceh were charged with inciting hatred against the government because they were giving out pamphlets (see: UAC-197-2008), while another was charged with treason for organising a peaceful demonstration (UAC-262-2008). The AHRC is alarmed by the increasing frequency with which the laws of the country are being manipulatively deployed to obstruct the work of human rights defenders, draining vital resources and distracting activists from important projects. These legal offensives also create an atmosphere of fear and deter others from speaking out against injustices. As a State Party to the International Covenant on Civil and Political Rights the government of Indonesia is obliged to respect the freedom of expression of its citizens, and to make additional efforts to protect the rights of those who fight for justice. The AHRC demands that the government immediately intervene to ensure that a prompt and impartial investigation is made into the accusations made against Mr. Hamid, and to guarantee that he will not be charged for simply speaking the truth. The AHRC also urges the government to start a thorough review of the defamation law to prevent further abuse by irresponsible officials. Last but not least, the government is strongly advised to persist in pursuing its investigation into Munirs murder. The instigators of the crime remain at large five years after the incident; a matter which should be a deep source of shame. The Supreme Court should review its acquittal of Mr. Muchdi PR in a trial that many considered unjust. Bringing the perpetrators to justice will be a huge step forward in Indonesias human rights movement, and show that civil society activists of Indonesia are valued. Article 310: ‘The person who intentionally harms someones honor or reputation by charging him with a certain fact, with the obvious intent to give publicity thereof, shall, being guilty of slander, be punished by a maximum imprisonment of nine months or a maximum fine of three hundred rupiahs. If this takes only place by means of writings or portraits disseminated, openly demonstrated or put up, the principal shall, being guilty of libel, be punished by a maximum imprisonment of one year and four months of a maximum fine of three hundred rupiahs. Neither slander nor libel shall exist as far as the principal obviously has acted in the general interest of for a necessary defense’. Please write to the following authorities calling for immediate intervention into the investigation regarding accusations of criminal defamation made against Mr. Usman Hamid. Please also call for review of the defamation law by the Indonesian government and for the protection of human rights defenders in Indonesia. Please be informed that the AHRC is writing a letter to the UN Special Rapporteur on the situation of human rights defenders, requesting their intervention in this case. I’m writing to express my deep concern at the accusation of criminal defamation against a leading rights activist by the former deputy chief of Indonesias State Intelligence Agency, after the activist testified against the latter for his involvement in the murder of Munir Said Thalib. I am alarmed by the increasing frequency with which the laws of the country are being manipulatively deployed to obstruct the work of human rights defenders. According to the information I have received, on September 3 Mr. Hamid received a summons letter from the police referring to a complaint filed on 9 January 2009 by the lawyer of Mr. Muchdi Purwopranjono, former deputy chief of State Intelligence Agency (BIN). The summons accused Mr. Hamid of criminal defamation. Mr. Hamid was a witness in Mr. Muchdi Purwopranjonos trial for his alleged involvement in instigating the assassination of human rights defender Munir Said Thalib five years ago. After being acquitted, Mr. Purwopranjono filed a complaint against Mr. Hamid and several other activists accusing them of yelling ‘Murderer, murderer’ in the court after the judge announced his acquittal. Based on this complaint the Indonesian National Police have recommended Mr. Hamid as a suspect, using Articles 310 and 314 of the Penal Code. The defamation law (found below) is a colonial legacy, and the governments reluctance to revise it has allowed its continual abuse by officials who wish to restrict freedom of expression. In this case it appears to be a particularly calculated attempt to turn the table against the accusers and silence witnesses, and must be challenged at all costs. I understand that this is not an isolated incident in Indonesia. In two other recent cases reported by the Asian Human Rights Commission, eight activists in Aceh were charged with inciting hatred against the government because they were giving out pamphlets, while another was charged with treason for organising a peaceful demonstration. Such cases drain vital resources and distract activists from important projects, and they are used to obstruct their work. These legal offensives also create an atmosphere of fear and deter others from speaking out against injustices. As a State Party to the International Covenant on Civil and Political Rights the government of Indonesia is obliged to respect the freedom of expression of its citizens, and to make additional efforts to protect the rights of those who fight for justice. I demand that the government immediately intervene to ensure that a prompt and impartial investigation is made into the accusations made against Mr. Hamid, and to guarantee that he will not be charged for simply speaking the truth. I also urge the government to start a thorough review of the defamation law to prevent further abuse by irresponsible officials. Last but not least, I call for the government’s persistence in pursuing its investigation into Munirs murder. The instigators of the crime remain at large five years after the incident; a matter which should be a deep source of shame. The Supreme Court should review its acquittal of Mr. Muchdi PR in a trial that many considered unjust. Bringing the perpetrators to justice will be a huge step forward in Indonesias human rights movement, and show that civil society activists of Indonesia are valued.